The Girardo & Co. strapline says it all: “Presenting the world’s most significant sports and racing cars” and they’re not kidding; their showroom is like a who’s who of motorsports history. While the brand is a relative newcomer to the historic car scene, the team behind Girardo & Co. are anything but. Comprising of three senior figures from famous auction-house RM Sotheby’s, the Girardo & Co. contact’s book is overflowing but the website was yet to be firing on all cylinders. We were engaged by Girardo & Co. to help them reach a new digital audience; the movers and shakers, the opinion formers and ultimately the historic car buyers of tomorrow, to engage with the company and talk about its ever-changing line-up of unique cars. 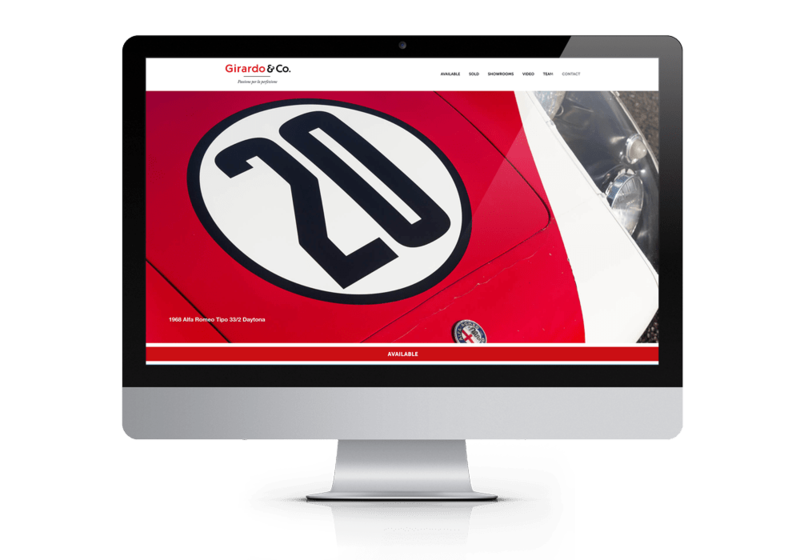 We suggested that Girardo & Co. start with a technical audit of their website, setup dashboards to show their key metrics, then run competitor analysis of key rivals to see what we can learn from their approach and finally, to run a targeted display campaign to showcase the visually stunning cars they have on offer. We have built our own audit process that checks over 120 different factors on any website, to ensure there aren’t any issues that will cause a poor organic search performance or user experience. Our technical audit covers a broad range of potential problems, such as content duplication, incorrectly configured directives for search engines, abnormally large image files and incorrectly configured site reporting. Our belief is that the client can make the best decisions when they have the right data in front of them. We configured bespoke Google Analytics Dashboards to give the Girardo team more visibility on their website visitors: who they are, where they’re coming from, what they’re viewing and the most valuable channels, from organic search to top referrers. These easy-to-glance dashboards are emailed to the team every week to keep them up to speed on how the website is performing. One of the best ways to establish yourself online is to understand what your rivals are doing and where you should focus your efforts. We carried out an intensive analysis of Girardo’s more-established rivals to understand: where they’re getting their traffic from, where they’re ranking in Google and what key search terms they’re ranking for and which editorial websites they have good relationships with. Girardo & Co’s cars do the talking, so it made sense to create a display campaign that covered two angles. Firstly, to present the company’s brand in front of a targeted audience of car lovers, to pique their interest in this new and bold contender in the classic car world. Secondly, to overtly display some of the stock, to draw attention to the wonderful cars on display. Tempting car lovers with images of beautifully shot supercars isn’t the hardest project we’ve ever had to work on. We also setup a remarketing campaign to target non-EU visitors to the website with a bold display advert to ensure that we get the Girardo name in front of first-time visitors to the website.